Jerome: British Historical Medals of the 17th Century: Books, Authors, Medallists, Collectors and Antiquaries covers the medallists, authors, collectors, medal dealers and booksellers associated with the ECW period, with expanded coverage to include British medals 1600 - 1688. It's a companion to our earlier work, The English Civil Wars: Medals, Historical Commentary & Personalities vols. 1 and 2 (also published by Spink), which drew together detailed information on some 900 individual medals reflecting some 400 subtypes of medals in private and public collections. In addition to medal aficionados and ECW enthusiasts and collectors, we've found these works to appeal to collectors of antiquarian books and those interested in British history and the history of British numismatics. S: What were medals typically awarded for during the period? A LARGER ROYALIST SILVER GILT MEDAL (M.I. 360/232; X 54 X 37 MM. ), LATE ECW PERIOD. NOTE THE PEARL (FOR A TEAR?). THE SIZE, METAL AND FINE WORKMANSHIP SUGGESTS THAT THIS PARTICULAR MEDAL WAS GIVEN TO, OR MADE FOR, A PERSON OF SOME IMPORTANCE. IMAGE COURTESY OF MORTON & EDEN LTD.
J: In the Middle Ages, royal orders and similar awards were exceptionally personal; they were issued by rulers, military commanders or prominent individuals as a token of positive regard or achievement but often also as a form of self-promotion or self-aggrandisement. Until the mid-17th century, the award of collars, breast stars and gold chains were a frequent means of recognising military success at the command level, while the common soldier was rewarded with coin, extra rations or drink. Junior officers might receive engraved swords. Medals for military service have a very long history in Britain, extending back to the reign of Elizabeth I, when they began to be issued as military rewards for outstanding service. 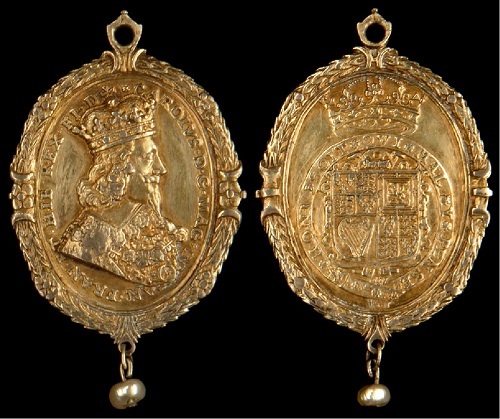 These were typically ‘jewels’ or stars of gold and enamel created for commanders such as Sir Francis Drake and Sir John Hawkins, as well as commemorative medals celebrating the defeat of the armada, although campaign medals are not known to have been intended for award to ‘common’ soldiers and sailors until the mid-17th century. It was during the English Civil War that the issuance of military medals came to be more of a common practice and the present system of medals began to be established. For example, medals such as those for the battles of Edgehill and Dunbar were created and awarded by King Charles I and Parliament respectively. In their conception, these generally correspond to our present campaign medals. While the Royalist medal for Edgehill was likely intended for issue to senior officers and thus may be seen to also be a continuation of the practice of rewarding leaders, but not common soldiers, the Dunbar medal was the first medal intended for issue to all ranks as a reward for their participation in that battle. Unfortunately, however, the few medals that were created were probably given to senior officers, Parliament never having appropriated the funds to pay for a general issue of the medal to all participants, numbering about 10,000. The ECW also saw the implementation of a practice, on both the Royalist and Parliamentarian sides, of awarding medals to individuals for acts of bravery in much the same way as is the case for present-day gallantry awards. Among these early awards were the Royalist ‘Forlorn Hope’ medals which can be identified as a military reward to individual soldiers of all ranks. Preceding and during the ECW, awards of money, food and drink also continued to be given by commanders: one can easier see how a ‘Forlorn Hope’ party would particularly be grateful for the latter on the evenings before (and after) an assault on a castle or other fortified position! An important aspect of collecting British military medals is being able to carry out research on specific recipients. This is not possible for most ECW medals, however, as in almost all cases the medals were not named and what little paperwork existed is now gone. Luckily, a very few award documents have survived with the accompanying medal and these can provide the names of the recipient. One of these medals, together with the award document signed by Sir Thomas Fairfax and issued to a soldier under his command - identified as ‘Mr. John Sharpe' - remained in the possession of the recipient’s family and in 2005 was gifted by his descendants to the British Museum’s Dept. of Coins and Medals. A SMALL ‘GENERAL FAIRFAX MEDAL’ (M.I.i 318/151; 25 x 21 mm.) 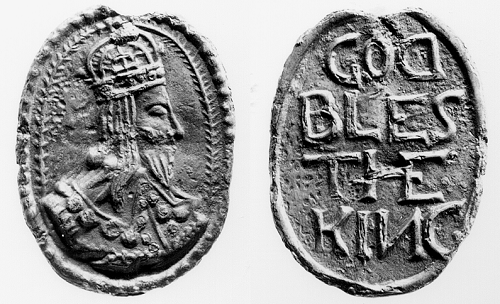 OF THE TYPE WHICH WAS AWARDED TO MR. JOHN SHARPE AND RECENTLY GIVEN TO THE BRITISH MUSEUM. IMAGE COURTESY THE TRUSTEES OF THE BRITISH MUSEUM. During this period unique awards were also created for award to individual officers: Capt. John Smith and Capt. William Rainsborough were two recipients of early gold medals. S: What were medals typically made of? J: The medals of the ECW period, in fact across the entire 17th century, are found in almost all metals. While those awarded to, or made for, senior officers and the aristocracy were usually of gold, silver and gilded silver, the great majority of medals are found in silver and other non-precious metals, including copper and white metal, likely reflecting the rank, social status or purse size of the person who ordered the manufacture. During the ECW, medals bearing the likeness of a leader such as Fairfax, Essex or Manchester were also probably purchased by some of their followers and here the purse size likely dictated the metal. With the exception of the ‘Forlorn hope’ medal, the warrant for which provided for “pain or punishment’ for unauthorised wear, I have not learned of any restrictions on the wearing of medals obtained by purchase during the ECW. S: Were medals equally bestowed on both Royalist and Parliamentarian sides? J: Generally, the Royalists paid attention to medals more so than did the Parliamentarians. Royal warrants were written for several medals, including the ‘Forlorn Hope’ medal, and the medals awarded to Capt. John Smith and Sir Robert Welch (or Welsh, Walsh). The Commonwealth did catch up later when it issued a series of medals to sea commanders, including Admirals Robert Blake and George Monck and a number of captains and other officers. Parliament also issued a warrant for the manufacture of a very expensive (£800) ‘jewel’ in precious metals and enamels to be awarded to General Sir Thomas Fairfax on his victory at Naseby in 1645. This jewel now resides at Seaton Delaval Hall, Northumberland. A CHARLES I MEMORIAL MEDAL OF THE KIND OFTEN WORN CONCEALED BY HIS FOLLOWERS AFTER THE ECW. IN SILVER-GILT. (M.I.I 361/235; 21 X 17.45 MM.). AUTHOR’S COLLECTION. Display of a medal could cause problems for an individual if it reflected loyalty to the ‘other side.’ For example, the wearing of a medal with the portraits of the past or present sovereign (or Protector, in the case of Cromwell) could have disastrous consequences if the particular ruler was out of office! 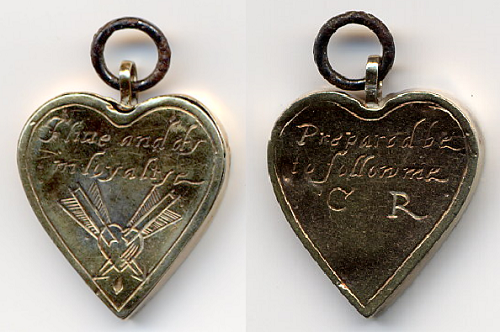 A LOCKET OR ‘FUNERAL MEDALET’ IN SILVER-GILT WORN BY ROYALIST SUPPORTERS AFTER THE EXECUTION OF CHARLES I. IN SILVER-GILT (M.I.I 366/249,. 21.7 X 19.6 MM.). AUTHOR’S COLLECTION. Thus, during the Protectorate, owners of medals or badges of Charles I or Prince Charles took care to either destroy them or to wear them in a concealed manner, while after the Restoration former Parliamentarian supporters could not be seen wearing ‘their side’s’ medals. In the former case, surreptitious wearing of small medals bearing the portrait of Charles I, particularly ‘funeral medalets,’ appears to have continued, these being broken out for more public display after the Restoration. S: How frequently do ECW medals come up for sale now? What is a typical sale price? J: The medals of the ECW period are scarce, and as many disappear into public or private collections, the former usually permanently and the latter for periods of decades at a time, they are becoming scarcer. Yet, there are still relative bargains to be found. For example, a recent Charles I memorial medal dated 1649 in copper sold for a hammer price of £130. At the same sale, a silver-gilt medalet for Charles I’s marriage to Henrietta Maria in 1625 sold for £140 and the same medalet in silver sold for £85. Nonetheless, the fact is that many of these medals are extraordinarily rare and their prices reflect this rarity at a time when interest in ECW artifacts has been steadily increasing. 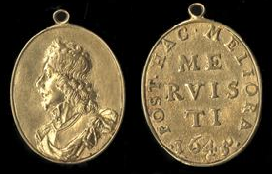 A good example is the Charles I memorial medal dated 1649 (see below) in gold, for which the hammer price was £4,000. In this case, the rarity or scarcity of the medal corresponds to the relative price. THE OBVERSES OF A CHARLES I MEMORIAL MEDAL (M.I.347/201; 34.5 MM. ), IN COPPER, SILVER AND GOLD. THE THREE MEDALS SOLD FOR £130, 400, AND 4,000, RESPECTIVELY. IMAGES COURTESY WOOLLEY & WALLIS SALISBURY, EX FOLEY COLLECTION. Not surprisingly, however, as with other collectables, in addition to scarcity, condition, attractiveness and provenance affect the price - although condition and physical attractiveness are less important to me than is the association value and provenance - by these I mean the ability to connect the individual medal to a person or event and the existence of an ownership history, ideally descending from the original owner to the present. S: Have you any personal favourites? THE CHARLES I, CROWNED, MEDAL IN PEWTER, CIVIL WAR PERIOD, NOW IN THE BRITISH MUSEUM COLLECTION (M.I.I 367/251; 39.7 X 29.7 MM.). IMAGE COURTESY TRUSTEES OF THE BRITISH MUSEUM. A close runner-up among my favorites is the Oxford Memorial medal, issued in 1649. In 1647, twenty-four ‘Parliamentary Visitors’ came to Oxford with the aim of ‘reforming’ the University. Frustrated in their aim by the administration and students, Parliament gave the ‘Visitors’ the power to administer the Covenant and Negative Oath, but they still met passive resistance. On a second visit, refusal to take the oath on the part of several hundred faculty and students resulted in their expulsion by the Visitors from their positions and the University. It is likely that many, if not the majority of those expelled, in refusing to renounce their consciences, lost whatever they possessed in life and never regained position or income, as meager as it had been. THE OXFORD MEMORIAL MEDAL (M.I.I 348/205; 29 MM. ), IN SILVER (AUTHOR’S COLLECTION) AND SILVER-GIILT (COURTESY WOOLLEY & WALLIS, SALISBURY, EX FOLEY COLLECTION.). The Oxford memorial medal was given as a token of support to those expelled members of the community. One’s heart must go out to those who put conscience and loyalty above expedience. Perhaps having been an academic gives me even greater empathy for these ‘poor scholars’! S: Which medals are rarest or most prized? J: I mention a medal or two in the book that have sold in the rarified £50,000+ range: these are unique pieces connected with specific events and have the provenance to support the connection. 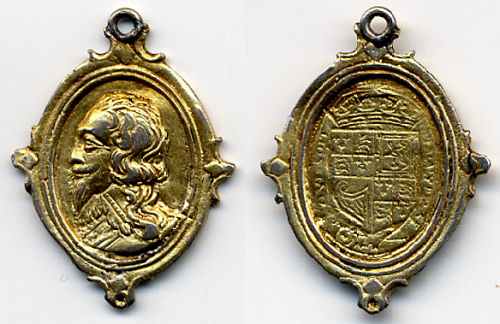 One example is the unique ‘Dominion of the Sea’ medal in gold owned by Charles I and given by him to Bishop William Juxon a few weeks before the former’s execution. This medal recently sold for $375,000! Another, the ‘Juxon medal,’ is actually a gold pattern five-unite coin which Charles I gave to Juxon while on the scaffold. Here we have two very rare numismatic items with unique and historically important connections to an important historical event. In the first case, the medal was unique and remained in the unbroken possession of the Juxon family until 2010. In the second case, the coin, one of two identical pieces given to Juxon, had passed from Charles I to Juxon, to his niece, then to prominent collectors and finally, after auction at Sotheby’s and Spink, to the British Museum. The price paid by the Museum when the piece was acquired in 1896 was £770. S: What originally sparked your interest in the field? J: My interest in English Civil War medals was part of an evolutionary progression. In 1974, having had an interest in British military history from a very early age, I was a collector of British militaria – uniforms, headdresses, swords, Victorian campaign medals and badges - until one day I came across an ECW medal. From that moment on, I realised that I was a medal collector - I now held in my hand a piece of history, in the form of a small work of art, which could be connected directly to a time, place and perhaps, if I was lucky, a person who had participated in history. Of course, I had tapped into the medal collector’s true passion - the story of the man or woman behind the medal. Soon afterwards I came across a Parliamentarian medal for the victory at Dunbar for sale. Although unnamed, as were almost all other medals of the ECW period, it was clearly associated with a time, place and person - Oliver Cromwell - and evocative of all that had occurred in that internecine war. Over time, as I came across other medals from the period, I became increasingly interested in the many variants that existed and I began to see these medals as very personal; it was likely, for instance, that these medals, except perhaps those to very senior officers, were worn constantly throughout a soldier’s or officer’s period of service and even his lifetime. In this regard, it is interesting that the ‘Forlorn Hope’ medal appears to have holes for sewing it to one’s jacket, jerkin, or other article of clothing. As time went on and as my collection grew, I also became interested in the medalists who had designed and made the medal. Soon the ECW period became the single focus of my collecting. Being a researcher by both inclination and profession, I began delving deeper into ECW medals and the people connected with them, and being an academic, of course I began keeping copious notes of what I had found: I should say ‘we’ rather than ‘I’, as my wife, whom I had caught peeking over my shoulder as I worked on my collection, soon occupied a seat at the table, and we became a research team. Then and now, my wife and I usually spent our vacations in Britain. Soon, these trips became research expeditions to the major repositories of ECW medals in the UK. Premiere among these is of course the British Museum’s Department of Coins and Medals, which houses the National Collection, in our opinion, the foremost collection of ECW and other medals in the country. For our research we also visited the Victoria & Albert, the Fitzwilliam Museum at Cambridge, the Heberden Coin Room at the Ashmolean Museum, Oxford, the National Museum of Scotland, the Hunterian Collection at the University of Glasgow, the Museum of London, the National Army Museum, and the Cromwell Museum, Huntingdon, as well as the collection of the American Numismatic Society in New York. During these visits we met curators and scholars who were able to answer some of our increasingly difficult questions. We also examined medals passing through sales at the major London auction houses. S: What are the major works associated with medal collecting from this period? J: The gold standard volumes on British medals are Hawkins, Franks, and Grueber’s’s classic Medallic Illustrations of British History (M.I. ), the first version of which was completed in 1852 and published in 1886, and its companion volume of plates of illustrations prepared by Herbert Grueber between 1904 and 1911. These volumes are necessarily descriptive surveys of some 3,000 British medals through the death of George II, providing a paragraph or two of description and history on each medal. Laurence Brown’s three volumes on British Historical Medals, 1760-1960 picks up where M.I. ends and surveys British medals from the accession of George III in 1760 through 1960. An additional 9,900 British medals appeared between the years 1760 and 1941! A very nice concise introduction to ECW coins and medals by Edward Besly, Coins and Medals of the English Civil War (1990) focuses on the mints operated by both the Royalists and Parliamentarians. The unique view we've taken in the new book is to integrate detailed information on ECW and 17th century medals in connection with the historical background and personages associated with them, either as subjects, medallists, collectors, authors or sellers. This simply does not exist elsewhere in print. Jerome J. Platt is a retired medical school professor of psychiatry, research director and research dean who has been an active collector and researcher of British medals for over 40 years. 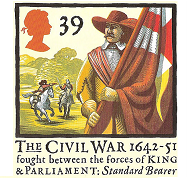 Originally trained as a psychologist, Dr Platt became interested in the personalities of those personages depicted on medals of the English Civil War. This volume is the result of his study of the men and women who are associated with the history of historical and commemorative medal design, manufacture, sale, collecting and scholarship. Dr Platt is also the author or editor of over a dozen books on drug addiction, research and psychological issues as well as The Whitewash Brigade - a history of the Hong Kong Plague medal (1894). Many thanks to Jerome for taking part in the Q&A, and also to Emma Howard at Spink for facilitating the interview. 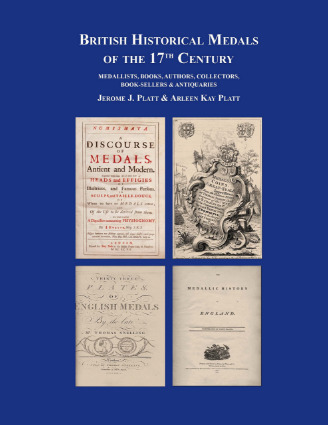 British Historical Medals of the 17th Century: Medallists, Books, Authors, Collectors, Booksellers & Antiquaries (Jerome J Platt and Arleen Kay Platt, 2017). Hardback, jacketed; 432 pages with colour illustrations throughout; RRP £50; ISBN: 978-1-907427-48-0; available April 2017. Some three and a half centuries ago, Britain was convulsed by a series of civil wars. The names of its participants and major battles Oliver Cromwell and Charles I, Cavaliers and Roundheads, Edgehill and Dunbar are still well known today. These wars saw the introduction of medals as rewards for gallantry and campaign service. This book places these medals within the historical context of the times. These volumes are an essential addition to the libraries of all who have an interest in the medals, personalities and events of the English Civil Wars. Building on earlier works on the subject, they provide detailed information which is indispensable for the collector, numismatist, auction house specialist and Civil War enthusiast as well as for the military or art historian with an interest in the period. The detailed information on over 900 individual medals illustrating over 400 subtypes in both private and public collections, accompanied by more than 500 photographs and illustrations of medals, many in colour, provides an important archival reference source, bringing the personalities of the figures of the period into focus. Hardback, clothbound in two volumes with slipcase; 808 pages with colour illustrations throughout; RRP £175, but available for a limited period only at £90; ISBN: 978-1-907427-15-2.